This feature is available on our Bronze, Silver and Gold plans. If you are on the Lite plan, you can upgrade via the billing settings page in your dashboard. You can get to Track Editor by logging into your Radio.co Dashboard and heading to Media > Tracks in the sidebar. Click the Actions (...) button next to the track you wish to edit, and select Track Editor. 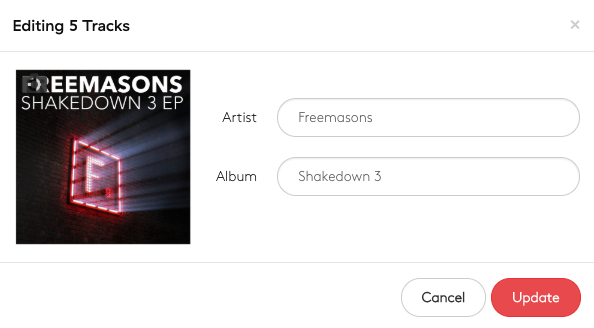 When you upload tracks to Radio.co, we automatically fetch artwork based on your track information. Sometimes we might not get it right, or may not be able to find your track in our system. 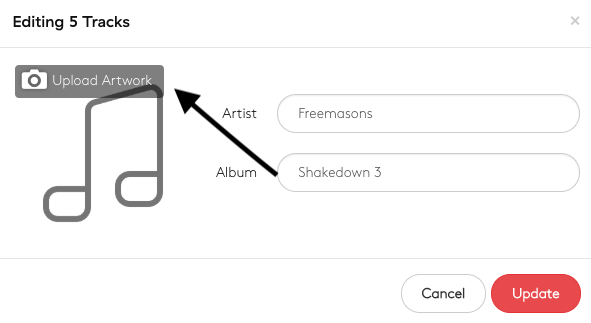 To solve this problem you can upload custom artwork to your tracks. This is also useful to brand your jingles or pre-recorded sponsored events. 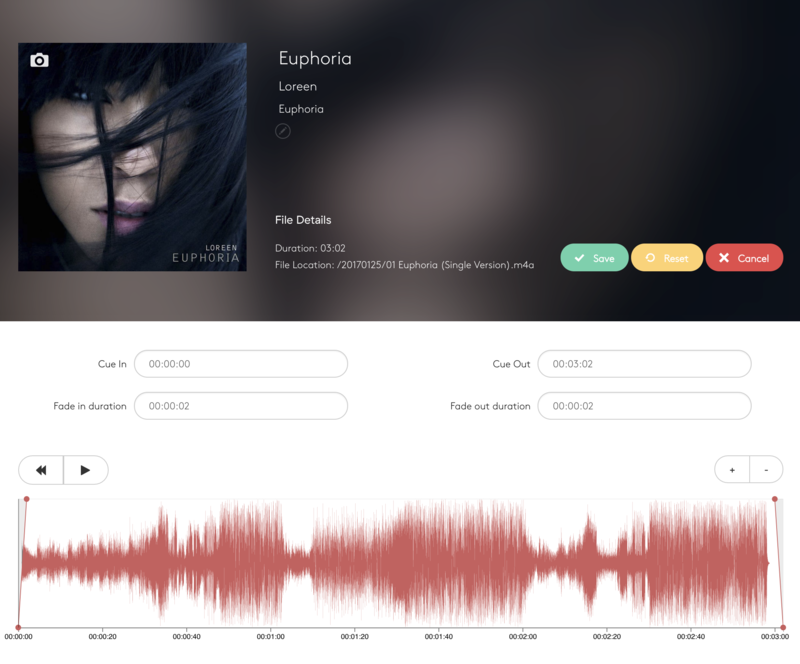 When you load up Track editor, the default artwork will appear (or the music note if no artwork is found). To upload custom artwork click the Camera icon in the upper left of the artwork and select Custom. Choose a file from your computer, ensuring it is at least 600x600px and in JPG or PNG format. If you want to revert or remove your custom artwork you can do so by clicking the Camera Icon and selecting None or Default. To edit the track title, artist or album, simply click them. A text field will appear as above. You can also click the Pencil button to reveal all text fields. Note: If you are using default artwork you will need to click Camera > Default after changing the track information to update the image. If you have lots of tracks which need updating, you can bulk update by ticking the boxes next to each track. Then, click the Edit button in the top right corner. A popup will appear which will allow you to change the artwork and track information of all of these tracks in one go. After adding some information, click Update. After clicking Update, all of the tracks will now have the correct information. Certain tracks have long intros and don't immediately start, but if you want to keep a momentum going in your shows then you can specify when you want your tracks to start and finish using the Waveform Editor at the bottom of the page. You can zoom in and out of the waveform by using the Zoom Controls on the right side of the page. Zooming in will show an overview and detailed waveform view as pictured above. To adjust the Cue In time, slide the Cue handle (at the bottom of the larger Waveform). To adjust the Fade In length, slide the Fade Handle (at the top of the larger Waveform). This will override the default fade set on your station for this particular track. You can preview the fade and cue modifications using the Preview Controls on the left side of the page. If you do not wish to use the Waveform editor, you can also adjust the values manually using the text boxes in the middle of the page. All times are entered HH:MM:SS. If you need to reset all Wave editor changes in this session, click the orange Reset button. If you want to discard all your changes, click the red Cancel button. When you have finished editing your track, click the green Save button. This will return you to the track list. Track information will be updated in the media list instantly and show when the track is next played. Note: Editing a track that is currently playing will not update its information until it is next played.